I'm a Dear Creatures fangirl. I'm coming to terms with that. Sometimes I try to play it cool... you know, it's kinda (really) dorky to be SO INTO anything, but this Fall line of theirs is just too good. I'm pretty much smitten with all of the pieces. Have you seen it? What do you think? Oh, I adore that dress! I spend so much time swooning over Dear Creatures. You look gorgeous. Super excited about fall tights too! I love their new line! and you look darling in this dress and I love the shoes too! The print on that dress is purrrfect. (Sorry, I just couldn't help myself!) Love the whole look. You can never go wrong with Dear Creatures!! Adorable as usual! I love those shoes so much - I really need to find something like that for the office. They are heels, but I feel like I could still run around in them. You are simply adorbs. 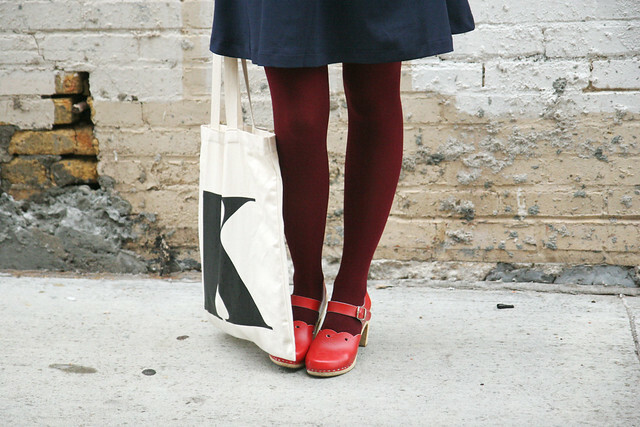 Love how you styled this outfit, particularly those tights with the clogs. Win! Oh I was just browsing their wares yesterday! I loved that kitty print top, I didn't realize there was a dress too! You look so lovely! you're suuuuchhh a cutie! 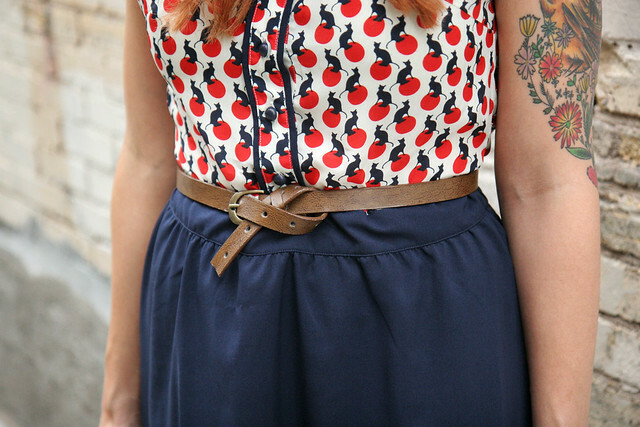 i love the red clogs and kitty blouse! I love love love Dear Creatures too. Everything they've got it so pretty. I love how you wore this dress. The clogs are the perfect match. I really, really like your shoes! How are they for sizing> DO they run true to size? Think I may have to splurge. These are pretty true- I wear 38 in clogs and these are great for me! I love this look, Ill probably never get enogh of telling you I would give you a best dressed lady award if there was one, ive never seen you wearing something I don't just love. So adorable! I love the blouse. What a cute little print! I really LOVE the combination of the blue with the colored tights! I am really into blue and red myself lately ! :D I think it's great for fall! i seriously cant get enough of your style GORGEOUS!!!!!!!!!!!! Aaahhh-- thank you so much!!! Chic in a Snapshot Winners! Here We Go: Catch Up!